This year I’ve started to do some freelance work for the Edmontonians newspaper. The Edmontonians is a monthly publication which focuses on business in the capital city. For the month of March, my photos from Refinery Night at the Art Gallery of Alberta are featured on the cover and in the center spread. For the month of April, the issue will be devoted to Women in Business and I was lucky enough to do two awesome shoots with some fabulous ladies this week. On Friday, I visited the law offices of Davis LLP where I had the opportunity to meet three of their newest partners – Jennifer Cleall, Wendy-Anne Berkenbosch, and Rachel Hamilton. All three ladies were so much fun to work with and I was so excited when they let me know that they didn’t want traditional, boring old office photos taken at a boardroom table. We took advantage of the early arrival of spring and headed out to Churchill Square to take some fun shots in front of City Hall. All three were a little hesitant at first but once we got going we started to have some fun and after just a few minutes they were posing for the camera like experienced models. Here are a few shots from our shoot. On the walk back to the office, I discovered that the law firm where my sister used to work, eventually became Davis LLP and Rachel actually recognized her name and had run across some files with my sister’s name on them. Small world. Afterwards, I also discovered that Rachel’s husband is Tyler Hamilton who was the winner of David Foster’s Star Search competition back in the fall of 2008. I was the official photographer for that event and photographed Tyler during the competition and during his big moment on stage at the Winspear. Again, small world sometimes. 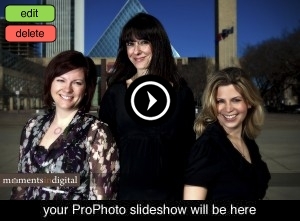 Thanks again to Jennifer, Wendy, and Rachel for a fun shoot. Watch for their story in the April issue of the Edmontonians. Very nicely done. I think my favourite is the black and white, posing as Charlie’s Angels. Very cool idea.